PEACE is yet to return to the Anglican community in Ilaro, in Yewa South Local Government Area, Ogun State. Some members of the Cathedral Church of Christ (Anglican Communion) in the area are at one another’s jugular. A reconciliation meeting held on April 12, 2016 to resolve some lingering issues in the church failed. What transpired on Sunday, May 1 showed that peace was not yet in sight at the church. And no one knows when it would return to the fold. Indeed, Sunday is a day when followers of Christ are expected to be peaceful, sober and heavenly-minded. But peace took flight from the Anglican community in Ilaro when some members of the church protested the continued featuring of Ven. Nathaniel Bamidele Oluwatade at the service, contrary to the earlier agreement at the peace meeting that he would be redeployed. Many members of the church, Daily Sun learnt, were opposed to his leadership style. An aggrieved congregant, who was part of the peace meeting but preferred to speak anonymously confirmed that before last Sunday’s debacle, it was resolved that Ven. Oluwatade should stand down, as part of the conditions for a lasting peace. “It was a total betrayal of trust, deceit and ungodliness to go back on the resolutions. The bishop has not told us what he shares in common with Ven. Oluwatade,” the man said.Daily Sun gathered that those who are bitterly opposed to Ven. Oluwatade listed his sins as his alleged sacking of all administrative staff of the church and the speculated discreet moves at transforming himself into the provost of the church against the wishes of the parishioners. The protest last Sunday morning was, however, halted by a detachment of policemen from Ilaro Police Division that stormed the church as early as 7am. The security men were there apparently in anticipation of a crisis, as the church was opening for normal Sunday worship service since it was shut on February 24. Before things got to a head, early signs of trouble started to show when Ven. Oluwatade, allegedly acting on the orders of Bishop of Yewa Diocese, Right Reverend Michael Adebayo Oluwarohunbi, changed all the keys to the church and refused, as it was the tradition of the church, to return them to the church janitor, whose duty it is to prepare and open the church for the day’s business. Signs that peace at the cathedral had diminished drastically then emerged when no fewer than eight worshippers opposed to the cleric were allegedly beaten and manhandled. The victims, Mrs. Oluyemisi Ogunnubi, 60, Chief Solomon Adeniji, 77, and his wife, Kikelomo, 67, were also allegedly hauled into a waiting police Hilux van with registration number NPF 6562C and driven away. An eyewitness said: “Those policemen were probably working for the bishop. Since the crisis started, they have always targeted those opposed to the way things were done in the church and with what happened today, nobody is in doubt anymore about who they are working for.” Another witness, who gave her name simply as Iya Hafsat, expressed displeasure at the shame the church had become in recent times. “This used to be a good church in this neighbourhood until we heard that the former provost, Very Rev. Solomon Rotimi Adewunmi, was frustrated into resigning his position in the church. Now, many things really happen here every weekday. It is a shame that the members can’t live according to the word they preach,” she said. Daily Sun was told that the church, which is located on Ona-Nla Quarters, Ilaro, had often been in the news for the wrong reasons, following sustained intrigues and leadership tussle. Hell’s gate was literally opened last March when some members of the church discovered during a revival programme that some unauthorised pillars were being erected at some strategic parts of the church building. This discovery, which did not go down well with most parishioners, led to a breakdown of the peace in the church. Consequently, this led to the church’s entrance being sealed. It was only reopened after the peace meeting. It was gathered that after the police had made arrests in and outside the church hall and threatened to shoot anyone who refused to leave the vicinity, about 30 congregants later gathered at about 9:55am to continue their normal church service. However, they were apprehensive and had their eyes fixed at the main entrance apparently for fear of the unknown. The reporter learnt that at the resumption of service, at exactly 10:24am, Ven. Oluwatade began raining curses on the perceived enemies of the church. He said: “Today is the final day this kind of thing would be tolerated in this church. Those of you that are present but have sympathy for them should go and tell them that we are ready to do battle. Except that they come before this church and prostrate and ask for forgiveness, the power of God will come upon them.” Oluwatade, who spoke amid songs, including: ‘Arise O Lord, Let Your Enemy Be Scattered,’ and ‘Our God is the God of War,’ among others, enjoined the congregants to pray fervently against the enemies of the church. Quoting copiously from the Holy Bible, he urged members to put on the armour of God and be prepared for the battle ahead. He further enjoined members not to be wary or discouraged by what took place earlier in the day, but to always make their presence felt at every service. All the text messages and telephone calls put to Bishop Oluwarohunbi and Ven. Oluwatade to hear their own sides of the story were ignored. 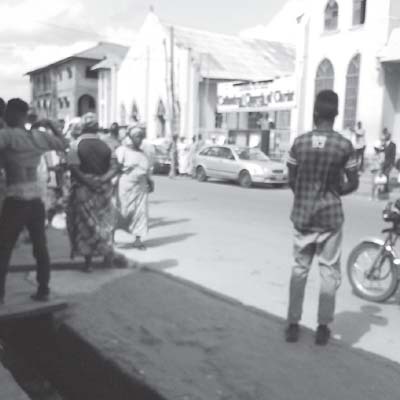 Meanwhile, speaking on telephone, the Divisional Police Officer (DPO) of Ilaro Police Station, Mr. Lukman Adejumo Raheem, a Chief Superintendent of Police (CSP), told the newspaper that his men were at the church simply to maintain the peace. He claimed that he and his men were not invited by any member of the church but simply made arrests when they saw people fighting in the street. He also denied that his men manhandled anyone. Let Love lead, a household divided against itself cannot stand.